Big Bud XXL Autoflowering by Zambeza seeds brings us the famed West Coast legend, the Ocean Grown OG Kush but now with autoflowering qualities so that really everyone can grow this classic. Given that her parent is the famously stable and always reliable OG, this is a plant that really everyone can grow easily, including those who don’t have any cannabis growing experience at all! What makes Big Bud XXL really earn her name is her extraordinary yields for an autoflower along with her massive XXL-sized buds. If you grow her indoors, you can look forward to a whopping up to 400-450g/m² of some OG goodness in a very short time! Outdoors, she’ll bring a good 100-175g to the table when conditions are right. Big Bud XXL will grow some mega-sized buds but the plant itself won’t grow too tall. Indoors she’ll stay at a convenient height of 80-110cm which makes her a good choice to grow where space is somewhat limited. Outdoors she can get a little taller, up to 150cm. Her life-cycle is pleasantly short with only 55-65 days from germination to harvest. Big Bud XXL has a slightly different flavour than the original OG. Her flavour profile is very complex, blending fresh notes with the spice and Skunk notes in an interesting and highly enjoyable way. With 13% of THC, she doesn’t exactly deliver a “knockout” effect but is still potent enough to make for awesome relaxation. Big Bud XXL can be the perfect smoke for all those who are not that much into super-strong hitters but who love their smokes on a more moderate side. She can be perfect with a relaxing night-time smoke that can help with sleeping problems or if you simply want an awesomely tasting smoke to chill at the end of a day. Big Bud XXL is a fantastic autoflowering indica that thanks to good OG genetics shine with extraordinary yields, super-fast growth and a great aroma. She can be a good choice for beginner cannabis growers and seasoned growers alike, anyone who wants a reliable, easy and fast autoflower that won’t let them down. 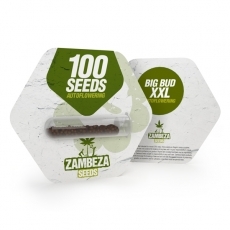 Big Bud XXL Autoflowering Bulk Seeds comes in packs of 100 seeds.